lxterminal opened via LXDE menu or another X terminal (xfce, xterm, etc) would not work with no messages output on screen. GENTOO_MIRRORS="ftp://ftp-stud.hs-esslingen.de/pub/Mirrors/gentoo/ ftp://ftp.dei.uc.pt/pub/linux/gentoo/ ftp://ftp.fi.muni.cz/pub/linux/gentoo/ ftp://ftp.free.fr/mirrors/ftp.gentoo.org/ ftp://ftp.gtlib.gatech.edu/pub/gentoo ftp://ftp.halifax.rwth-aachen.de/gentoo/ ftp://ftp.heanet.ie/pub/gentoo/ ftp://ftp.iij.ad.jp/pub/linux/gentoo/ ftp://ftp.jaist.ac.jp/pub/Linux/Gentoo/ ftp://ftp.kaist.ac.kr/gentoo/ ftp://ftp.lanet.kr/pub/gentoo/ ftp://ftp.las.ic.unicamp.br/pub/gentoo/ ftp://ftp.linux.org.tr/gentoo/ ftp://ftp.mirrorservice.org/sites/distfiles.gentoo.org/ ftp://ftp.rnl.tecnico.ulisboa.pt/pub/gentoo/gentoo-distfiles/ ftp://ftp.snt.utwente.nl/pub/os/linux/gentoo ftp://ftp.swin.edu.au/gentoo ftp://ftp.twaren.net/Linux/Gentoo/ ftp://ftp.uni-erlangen.de/pub/mirrors/gentoo ftp://ftp.ussg.iu.edu/pub/linux/gentoo ftp://ftp.vectranet.pl/gentoo/ ftp://ftp.wh2.tu-dresden.de/pub/mirrors/gentoo ftp://gd.tuwien.ac.at/opsys/linux/gentoo/ ftp://gentoo.bloodhost.ru/ ftp://gentoo.c3sl.ufpr.br/gentoo/ ftp://gentoo.imj.fr/pub/gentoo/ ftp://gentoo.mirror.web4u.cz/ ftp://gentoo.mirrors.ovh.net/gentoo-distfiles/ ftp://gentoo.mirrors.pair.com/ ftp://gentoo.netnitco.net/pub/mirrors/gentoo/source/ ftp://gentoo.wheel.sk/pub/linux/gentoo/ ftp://lug.mtu.edu/gentoo/ ftp://mirror.bytemark.co.uk/gentoo/ ftp://mirror.csclub.uwaterloo.ca/gentoo-distfiles/ ftp://mirror.dkm.cz/gentoo/ ftp://mirror.iawnet.sandia.gov/pub/gentoo/ ftp://mirror.isoc.org.il/gentoo/ ftp://mirror.leaseweb.com/gentoo/ ftp://mirror.mdfnet.se/gentoo ftp://mirror.neolabs.kz/gentoo/pub ftp://mirror.netcologne.de/gentoo/ ftp://mirror.switch.ch/mirror/gentoo/ ftp://mirror.yandex.ru/gentoo-distfiles/ ftp://mirrors.rit.edu/gentoo/ ftp://mirrors.soeasyto.com/distfiles.gentoo.org/ ftp://mirrors.tera-byte.com/pub/gentoo ftp://mirrors.xmu.edu.cn/gentoo ftp://sunsite.informatik.rwth-aachen.de/pub/Linux/gentoo ftp://trumpetti.atm.tut.fi/gentoo/ ftp://tux.rainside.sk/gentoo/ ftp://xeon.gentoo.ru/mirrors/gentoo/distfiles/ http://cosmos.illinois.edu/pub/gentoo/ http://ftp-stud.hs-esslingen.de/pub/Mirrors/gentoo/ http://ftp.daum.net/gentoo/ http://ftp.dei.uc.pt/pub/linux/gentoo/ http://ftp.fi.muni.cz/pub/linux/gentoo/ http://ftp.halifax.rwth-aachen.de/gentoo/ http://ftp.heanet.ie/pub/gentoo/ http://ftp.iij.ad.jp/pub/linux/gentoo/ http://ftp.jaist.ac.jp/pub/Linux/Gentoo/ http://ftp.kaist.ac.kr/pub/gentoo/ http://ftp.lanet.kr/pub/gentoo/ http://ftp.linux.org.tr/gentoo/ http://ftp.ntua.gr/pub/linux/gentoo/ http://ftp.rnl.tecnico.ulisboa.pt/pub/gentoo/gentoo-distfiles/ http://ftp.romnet.org/gentoo/ http://ftp.snt.utwente.nl/pub/os/linux/gentoo http://ftp.swin.edu.au/gentoo http://ftp.twaren.net/Linux/Gentoo/ http://ftp.uni-erlangen.de/pub/mirrors/gentoo http://ftp.vectranet.pl/gentoo/ http://gd.tuwien.ac.at/opsys/linux/gentoo/ http://gentoo-euetib.upc.es/mirror/gentoo/ http://gentoo.aditsu.net:8000/ http://gentoo.bloodhost.ru/ http://gentoo.c3sl.ufpr.br/ http://gentoo.cs.uni.edu/ http://gentoo.gossamerhost.com http://gentoo.iteam.net.ua/ http://gentoo.mirror.web4u.cz/ http://gentoo.mirrors.easynews.com/linux/gentoo/ http://gentoo.mirrors.ovh.net/gentoo-distfiles/ http://gentoo.mirrors.pair.com/ http://gentoo.mirrors.tds.net/gentoo http://gentoo.mirrors.tera-byte.com/ http://gentoo.modulix.net/gentoo/ http://gentoo.netnitco.net http://gentoo.osuosl.org/ http://gentoo.prz.rzeszow.pl http://gentoo.supp.name/ http://gentoo.wheel.sk/ http://linux.rz.ruhr-uni-bochum.de/download/gentoo-mirror/ http://lug.mtu.edu/gentoo/ http://mirror.bytemark.co.uk/gentoo/ http://mirror.csclub.uwaterloo.ca/gentoo-distfiles/ http://mirror.dkm.cz/gentoo/ http://mirror.eu.oneandone.net/linux/distributions/gentoo/gentoo/ http://mirror.iawnet.sandia.gov/gentoo/ http://mirror.isoc.org.il/pub/gentoo/ http://mirror.leaseweb.com/gentoo/ http://mirror.lug.udel.edu/pub/gentoo/ http://mirror.mdfnet.se/gentoo http://mirror.neolabs.kz/gentoo/pub http://mirror.netcologne.de/gentoo/ http://mirror.qubenet.net/mirror/gentoo/ http://mirror.switch.ch/ftp/mirror/gentoo/ http://mirror.usu.edu/mirrors/gentoo/ http://mirror.yandex.ru/gentoo-distfiles/ http://mirrors.163.com/gentoo/ http://mirrors.evowise.com/gentoo/ http://mirrors.rit.edu/gentoo/ http://mirrors.soeasyto.com/distfiles.gentoo.org/ http://mirrors.telepoint.bg/gentoo/ http://mirrors.xmu.edu.cn/gentoo http://mirrors.xservers.ro/gentoo/ http://trumpetti.atm.tut.fi/gentoo/ http://tux.rainside.sk/gentoo/ http://www.gtlib.gatech.edu/pub/gentoo http://www.las.ic.unicamp.br/pub/gentoo/ http://www.mirrorservice.org/sites/distfiles.gentoo.org/ https://ftp.lanet.kr/pub/gentoo/ https://mirror.dkm.cz/gentoo/ rsync://ftp-stud.hs-esslingen.de/gentoo/ rsync://ftp.fi.muni.cz/pub/linux/gentoo/ rsync://ftp.halifax.rwth-aachen.de/gentoo/ rsync://ftp.heanet.ie/pub/gentoo/ rsync://ftp.iij.ad.jp/pub/linux/gentoo/ rsync://ftp.jaist.ac.jp/pub/Linux/Gentoo/ rsync://ftp.linux.org.tr/gentoo-distfiles/ rsync://ftp.rnl.tecnico.ulisboa.pt/pub/gentoo/gentoo-distfiles/ rsync://ftp.snt.utwente.nl/gentoo rsync://ftp.vectranet.pl/gentoo/ rsync://ftp6.linux.cz/pub/linux/gentoo/ rsync://gentoo.bloodhost.ru/gentoo-distfiles rsync://gentoo.c3sl.ufpr.br/gentoo/ rsync://gentoo.cs.uni.edu/gentoo-distfiles rsync://gentoo.gossamerhost.com/gentoo-distfiles/ rsync://gentoo.prz.rzeszow.pl/gentoo rsync://mirror.bytemark.co.uk/gentoo/ rsync://mirror.dkm.cz/gentoo/ rsync://mirror.eu.oneandone.net/gentoo/ rsync://mirror.leaseweb.com/gentoo/ rsync://mirror.neolabs.kz/gentoo rsync://mirror.netcologne.de/gentoo/ rsync://mirrors.rit.edu/gentoo/ rsync://mirrors.telepoint.bg/gentoo/ rsync://mirrors.tera-byte.com/gentoo rsync://mirrors.xmu.edu.cn/gentoo/ rsync://rsync.gtlib.gatech.edu/gentoo rsync://rsync.mirrorservice.org/distfiles.gentoo.org/ rsync://trumpetti.atm.tut.fi/gentoo/"
USE="X acl alsa amd64 aspell berkdb bzip2 cli crypt cxx dbus dri gdbm gstreamer gtk hal iconv ipv6 jpeg ldap libtirpc multilib ncurses nls nptl nptlonly opengl openmp pam pcre policykit readline seccomp ssl svg systemd tcpd udev unicode xattr zlib" ABI_X86="64 32" ALSA_CARDS="ali5451 als4000 atiixp atiixp-modem bt87x ca0106 cmipci emu10k1x ens1370 ens1371 es1938 es1968 fm801 hda-intel intel8x0 intel8x0m maestro3 trident usb-audio via82xx via82xx-modem ymfpci" APACHE2_MODULES="actions alias auth_basic auth_digest authn_anon authn_dbd authn_dbm authn_default authn_file authz_dbm authz_default authz_groupfile authz_host authz_owner authz_user autoindex cache dav dav_fs dav_lock dbd deflate dir disk_cache env expires ext_filter file_cache filter headers ident imagemap include info log_config logio mem_cache mime mime_magic negotiation proxy proxy_ajp proxy_balancer proxy_connect proxy_http rewrite setenvif so speling status unique_id userdir usertrack vhost_alias cgi cgid slotmem_shm" APACHE2_MPMS="prefork" CALLIGRA_FEATURES="karbon plan sheets stage words" COLLECTD_PLUGINS="df interface irq load memory rrdtool swap syslog" CPU_FLAGS_X86="mmx mmxext popcnt sse sse2 sse3 sse4_1 sse4_2 ssse3" ELIBC="glibc" GPSD_PROTOCOLS="ashtech aivdm earthmate evermore fv18 garmin garmintxt gpsclock isync itrax mtk3301 nmea ntrip navcom oceanserver oldstyle oncore rtcm104v2 rtcm104v3 sirf skytraq superstar2 timing tsip tripmate tnt ublox ubx" INPUT_DEVICES="libinput keyboard mouse" KERNEL="linux" LCD_DEVICES="bayrad cfontz cfontz633 glk hd44780 lb216 lcdm001 mtxorb ncurses text" LIBREOFFICE_EXTENSIONS="presenter-console presenter-minimizer" OFFICE_IMPLEMENTATION="libreoffice" PHP_TARGETS="php5-6 php7-1" POSTGRES_TARGETS="postgres9_5 postgres10" PYTHON_SINGLE_TARGET="python3_6" PYTHON_TARGETS="python2_7 python3_6 python3_4 python3_5" RUBY_TARGETS="ruby23" USERLAND="GNU" VIDEO_CARDS="radeon" XTABLES_ADDONS="quota2 psd pknock lscan length2 ipv4options ipset ipp2p iface geoip fuzzy condition tee tarpit sysrq steal rawnat logmark ipmark dhcpmac delude chaos account"
5. 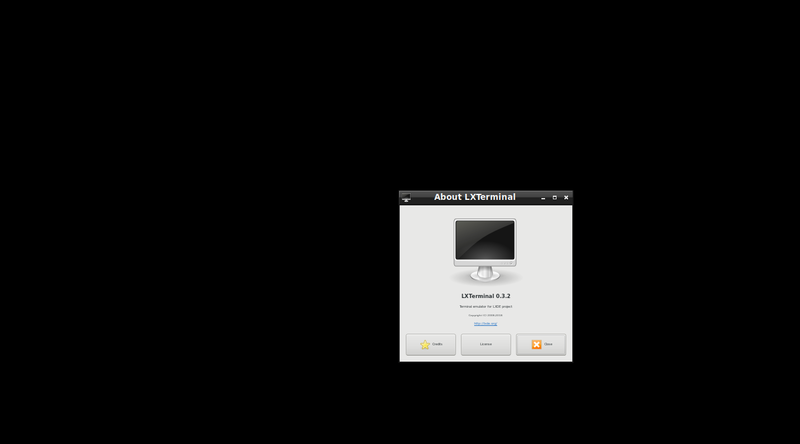 Tried re-emerging lxterminal with GTK3 enabled and disabled without any effect. I've been using LXDE & lxterminal 4 over a decade now without any serious issue. Don't have the fainted idea what may happen on your side. drwx------ 2 luc root 40 oct. 20 00:28 .
drwxr-xr-x 3 root root 60 oct. 20 00:28 ..
My apologizes for such a little help. Maybe https://bugs.debian.org/cgi-bin/bugreport.cgi?bug=862098 could help 2 diagnose. I'm in a single user case in witch such an issue may not reveal itself. Are u user ID 1002; what happens if you delete the /run/user/..... suspected file? Can you launch txlterminal thereafter? Hello, and thank you for taking time to help me out. I appreciate it. Sorry, I did not mention this before buy yes, I did delete that file to see if this resolved but no, even after the deletion of /var/run/1002/.lx... file the laxterminal does not open. I am the user with UID 1002. I will look at the debian link you have provided, in a bit. Thanks! Tried emerging without CCACHE feature but still no avail. Are you using lxterminal 0.3.1 ? Thks 4 ur attention,, interest & support. I 'm trying to understand why your sys is using sockets and mine doesn't. Are you running concurrent desktops? Sorry for delay in reply and thanks for continuous help. My lxdm version matches with that of yours. >Are you running concurrent desktops? that is running on the box. The first one is for console X access and other one is for VNC access to that X session when I need it. I run startx to start my X session when the system boots. I am surprised that everything else opens but lxterminal. Also looked at the Debian bug you pointed out at but I am not able to use that information for any additional benefits although it is very much likely that issue mentioned in the bug is what I may be facing. I have tried deleting the "/run/user/1002/.lxterminal-socket-:0.0" but it would get get auto created on next run for 'lxterminal' and same result that lxterminal would not open. The fix cited in that commit should have been applied before the code was ever pushed. I'm surprised their compiler options didn't break the build the moment they got that wrong. Regardless, it looks like an important fix and should be very safe. I suggest including it as a local patch, regardless of whether it fixes your immediate problem. I re-emerged lxterminal 0.3.1 with following environmental variable set.